This antibody recognizes native as well as denatured reduced forms of purified Maltose Binding Protein (MBP) or MBP fusion proteins. Our Abpromise guarantee covers the use of ab49923 in the following tested applications. WB 1/1000. Predicted molecular weight: 43 kDa. Epitope tagging offers an easy and universal strategy for the identification and purification of proteins derived by recombinant DNA technology. The insertion of a Maltose Binding Protein (MBP) tag creates a stable fusion product that does not interfere with the bioactivity of the protein or with the biodistribution of the MBP tagged product. Cleavage by factor Xa separates MBP from its partner protein. 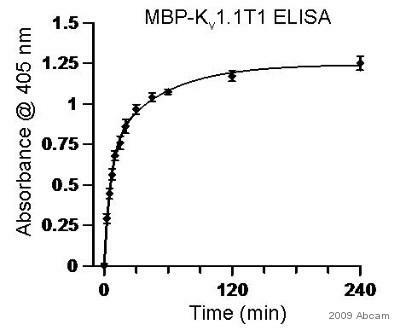 ab49923 staining Maltose binding protein by ELISA. The sample was blocked in 1% milk for 1 hour at 18°C. The primary was diluted at 1/2000 in PBS-Tween20 buffer and incubated with sample for 1 hour at 18°C. Publishing research using ab49923? Please let us know so that we can cite the reference in this datasheet.